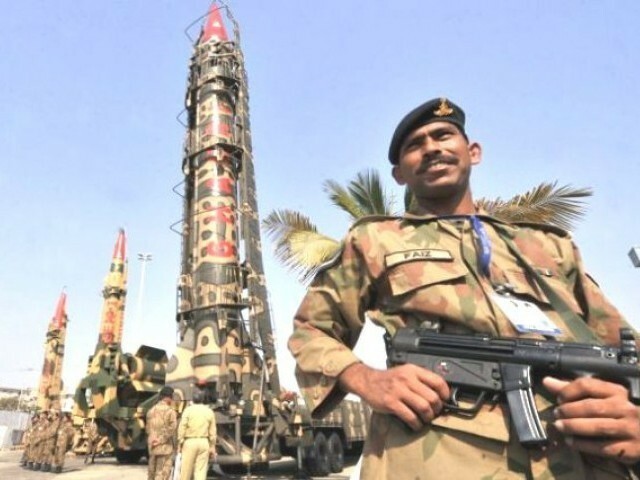 Pakistan and India have steadily increased their nuclear arsenal from 60-80 and 70-90 warheads in 2010, to 110-120 and 90-110 respectively by 2014, a new report by the Stockholm International Peace Research Institute (SIPRI) said on Monday. According to the report, both Pakistan and India have not only been developing new systems capable of delivering nuclear weapons but also expanding their capacities to produce fissile material for military purposes. The data compiled by the SIPRI shows that at the start of 2014, the nine nuclear armed states, namely United States, Russia, United Kingdom, France, China, India, Pakistan, Israel and North Korea together possessed approximately 16 300, nuclear warheads, while the number of active/deployed nuclear weapons was around 4000. NEW DELHI: India is expanding a covert uranium enrichment plant that could potentially support the development of thermonuclear weapons, a defence research group said on Friday, raising the stakes in an arms race with China and Pakistan. The revelation highlights a lack of nuclear safeguards on India under new Prime Minister Narendra Modi, while sanctions-bound Iran faces minute scrutiny in talks with world powers over its own nuclear programme. New units at the Indian Rare Metals Plant would boost India´s ability to produce weapons-grade uranium to twice the amount needed for its planned nuclear-powered submarine fleet, IHS Jane´s said. The facility, located near Mysore in southern India, could be operational by mid-2015, the research group said, basing its findings on analysis of satellite imagery and public statements by Indian officials. “Taking into account all the enriched uranium likely to be needed by the Indian nuclear submarine fleet, there is likely to be a significant excess,” Matthew Clements, editor of IHS Jane´s Intelligence Review, told Reuters. “One potential use of this would be for the development of thermonuclear weapons. “No comment was available from the Indian government press office or the foreign ministry. Pakistan reacted with consternation, with a senior aide to Prime Minister Nawaz Sharif saying the news underscored India´s “established hegemony”.”This is something that India has been trying to develop for a long time,” said Tariq Azeem. “We don´t want any nuclear race. That doesn´t bode well for either country. “Unlike Iran, India is not a signatory to the nuclear Non-Proliferation Treaty. New Delhi tested its first nuclear weapon in 1974, provoking international sanctions that barred it from importing nuclear technology and materials. It conducted tests again in 1998 that drew a quick response from Pakistan, triggering an arms race between the neighbours, who have fought three wars since independence in 1947. A civil nuclear cooperation deal with the United States, sealed in 2008, gave India access to know-how and fuel in return for a pledge - so far unfulfilled - to bring in US firms to expand India´s nuclear power generation capacity. The pact exempts military facilities and stockpiles of nuclear fuel from scrutiny by the International Atomic Energy Agency, a United Nations watchdog. The Mysore plant is not subject to IAEA safeguards. The IAEA declined to comment. The exemption, granted by the administration of President George W. Bush, faced opposition from China and Pakistan, India´s regional rivals, and European nations who said it would undermine efforts to control the spread of nuclear weapons. Based on its analysis of commercial satellite images, IHS Jane´s has identified what appears to be a new uranium hexafluoride plant that would increase the uranium enrichment capacity of the Mysore facility. The plant would be able to produce a surplus of around 160 kilos a year of uranium enriched to 90 percent purity, IHS Jane´s reckons. That is roughly double the needs of the nuclear submarine fleet that India is developing to supplement its land-based missile arsenal - and enough to make five atomic bombs. By blending the uranium with its existing stock of plutonium, India could develop thermonuclear weapons that have a more complex detonation process and greater force than simpler weapons.”Whether or not India uses the plant mainly for fuel for reactors and naval vessels as is sometimes surmised, it adds to India´s already far greater advantage over Pakistan in terms of nuclear weapons production potential,” said Mark Fitzpatrick, director of the non-proliferation programme at the International Institute for Strategic Studies (IISS). “It also brings India closer to matching China, which is how most Indians would probably see it.”The IHS findings have been corroborated by other analysts, with the Stockholm International Peace Research Institute (SIPRI) writing this week that the Mysore facility could signify India´s intent to move towards thermonuclear weapons. India is estimated by SIPRI to hold 90 to 110 nuclear weapons in its arsenal.The IHS assessment revealed incremental progress at Mysore since the Washington-based Institute for Science and International Security (ISIS), in a report last December, identified the construction of a new gas centrifuge plant. The revelation highlights a lack of nuclear safeguards on India, while sanctions-bound Iran faces minute scrutiny in talks with world powers over its own nuclear programme. New units at the Indian Rare Metals Plant would boost India’s ability to produce weapons-grade uranium to twice the amount needed for its planned nuclear-powered submarine fleet, IHS Jane’s said. “Taking into account all the enriched uranium likely to be needed by the Indian nuclear submarine fleet, there is likely to be a significant excess,” Matthew Clements, editor of IHS Jane’s Intelligence Review, said. No comment was available from the Indian government press office or the foreign ministry. Pakistan reacted with consternation, with an aide to Prime Minister Nawaz Sharif saying the news underscored India’s “established hegemony”. Unlike Iran, India is not a signatory to the nuclear Non-Proliferation Treaty. New Delhi tested its first nuclear weapon in 1974, provoking international sanctions that barred it from importing nuclear technology and materials. It conducted tests again in 1998 that drew a quick response from Pakistan, triggering an arms race between the neighbours. A civil nuclear cooperation deal with the United States, sealed in 2008, gave India access to know-how and fuel in return for a pledge — so far unfulfilled — to bring in US firms to expand India’s nuclear power generation capacity. SATELLITE VIEW: Based on its analysis of commercial satellite images, IHS Jane’s has identified what appears to be a new uranium hexafluoride plant that would increase the uranium enrichment capacity of the Mysore facility. The plant would be able to produce a surplus of around 160kg a year of uranium enriched to 90 per cent purity, IHS Jane’s says. That is roughly double the needs of the nuclear submarine fleet that India is developing to supplement its land-based missile arsenal — and enough to make five atomic bombs. By blending the uranium with its existing stock of plutonium, India could develop thermonuclear weapons that have a more complex detonation process and greater force than simpler weapons. “Whether or not India uses the plant mainly for fuel for reactors and naval vessels as is sometimes surmised, it adds to India’s already far greater advantage over Pakistan in terms of nuclear weapons production potential,” said Mark Fitzpatrick, director of the non-proliferation programme at the International Institute for Strategic Studies (IISS). The IHS findings have been corroborated by other analysts, with the Stockholm International Peace Research Institute (SIPRI) writing this week that the Mysore facility could signify India’s intent to move towards thermonuclear weapons.